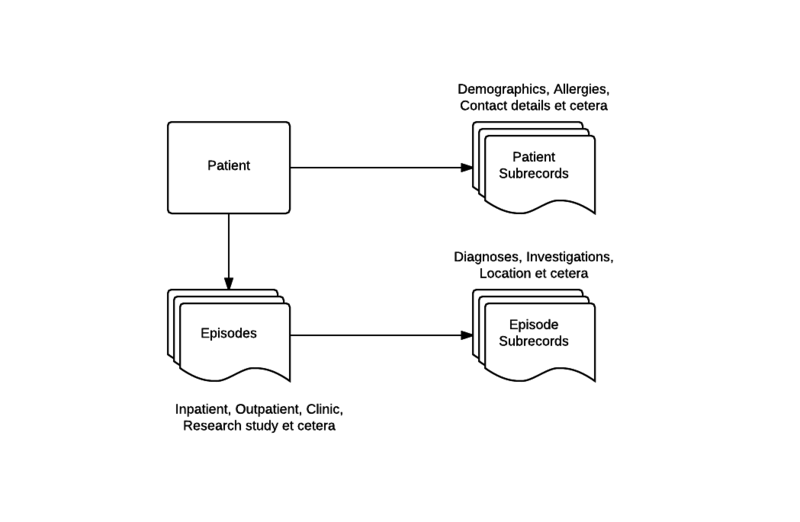 The Opal data model allows for patients to have multiple sequential or concurrent Episodes of care. Some information is linked to an Episode, some is linked to a Patient. A Patient will have Subrecords (such as e.g. Demographics) which follow them across multiple episodes. These are information linked to a particular person, and should be implemented as Django models that inherit from the opal.models.PatientSubrecord base class. An Episode is linked to a Patient, and will contain some metadata about the type and date of the episode. The field Episode.category_name stores a string representing the relevant EpisodeCategory e.g. ('Inpatient', 'Outpatient', ...), while a category object is returned from the episode.category field. The start and end dates of an Episode may be retrieved from the start and end properties. An Episode will have Subrecords (such as e.g. Diagnosis) which are linked to this episode of care. These should be implemented as Django models that inherit from the opal.models.EpisodeSubRecord base class. Opal ships with a wide range of core clinical concepts implemented as Abstract Subrecords. Applications that are generated via the $ opal startproject command will automatically contain concrete implementations of these models in the application. Full documentation of these models is available in the Archetypes documentation. Opal comes with a set of clinical terminology data models out of the box. - we often want to link our records to one of these - for example to record a type of condition a patient might have, or a drug they are taking. Full documentation of these is available in the Reference Data documentation.